Hail and well met! We are the Figures in the Fog and today we’ll be reviewing the new cards for Ashes: Rise of the Phoenixborn, added in The Ghost Guardian . This is the third entry in this series, so if you haven’t read the others, (shame on you mortal) you can find them here: http://www.strangecopy.com/index.php/2018/09/16/figures-in-the-fog-review-rimea-careworn/ and here: http://www.strangecopy.com/index.php/2018/09/24/figures-in-the-fog-reviews-ghastly-fiends/. For those brave enough to hear, we have 3 new cards to introduce today, including 2 new Ready Spells and 1 Action Spell. The first card today is a new powerful Ready Spell called Augury. Augury costs 1 Sympathy class die and a Main Action to play. 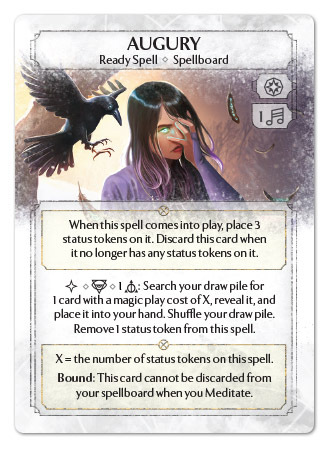 Once in play, Augury gets 3 status tokens placed upon it and has the Bound ability, cannot be discarded from the Spellboard through Meditation. Activating Augury costs a Side Action, placing an Exhaustion token on Augury, and a basic die, then the user may search their draw pile, for a card with a Magic Play Cost equal to the number of status tokens on Augury, and then removes 1 status token from Augury. When Augury has no more status tokens on it, it gets discarded. Magic Play Cost is a new term in the Ashes lexicon, referring to the total number of dice in the cards play cost (the upper right hand corner of the card). Consider the Reaction Spell, Sleeping Widows costs 2 Ceremonial class dice to play, so it’s Magic Play Cost would be 2, 1 for each die it would cost to play. Celestial Knight’s Magic Play Cost is 3, while Elephant Rider’s Magic Play Cost is 7. So Augury is effectively a limited Open Memories, allowing players to search their deck for a specific card, as long as its Magic Play Cost is equal to the number of Status tokens on Augury. But unlike, Open Memories, a player can get repeated value out of Augury, but with the restriction of searching for 3 cost, 2 cost, and a 1 cost card. The biggest problem with Augury, is that currently, the cards most frequently taken using Open Memories are Ready Spells with focus or focus like effects, like Summon Indiglow Creeper or Summon Shadow Spirit. And these Ready Spell cards all tend to have a Magic Play Cost of 0, which can’t be gained by using Augury. X: The potential of this card is incredible! The thought of paying a total of 4 dice over 3 rounds, to get 3 cards of your choice from your deck is awesome. But unfortunately, the statement that the Magic Play Cost of the card must be EQUAL to the to the number of status tokens on Augury hurts this card so much. With that additional caveat, Augury goes from a card that could be a great First Five for lots of Sympathy decks, especially Creeper decks, to a card that might be relegated to a heavy Ally Jessa, Orrick, or Victoria; who could use this card to bring forth a second Hammer Knight, or other powerful Ally during the first round. But for anyone brave enough to run it, I love the idea of leaving it at 1 token, for an on demand Particle Shield. N: I dunno if I’ll play this card much. So many of the cards I’d like to grab with something like Open Memories have a play cost of 0. As Xander mentioned above, I think Orrick is probably a pretty solid choice for this card, especially one running Mounts. I could see a r1 Aftershock ally, r2 Dark reaping or Gates, r3 variable tech, perhaps Fire Archer or Blood Chains. The next card is an Action Spell that also used Magic Play Cost called Shared Sorrow. 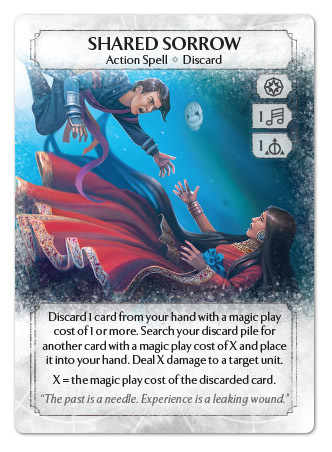 By using a Main Action, a Sympathy class die, and a basic die, the user must discard a card from their hand, and then the user gets to search their discard pile for a card with the same Magic Play Cost as the discarded card and put it into their hand. In addition, the user then gets to deal a target Unit damage equal to the Magic Play Cost of the discarded card. Remember those days, up until Thursday, when a card would get discarded due to Meditating and it would be lost forever. Well, with Shared Sorrow, it is now possible to get those cards back, albeit at a significant cost. While two dice doesn’t seem like a huge cost, there are a number of hidden costs for this card. First and foremost, it costs a card from the user’s hand, but more specifically it costs a card with the same Magic Play Cost as the card in the discard pile. That dependency on Magic Play Cost creates an additional cost in terms of deck construction, in addition to having powerful cards, the user will have to include other cards with the same Magic Play Cost in order to to use it. That being said, the additional effect of getting to deal damage equal to the Magic Play Cost of the discarded card is a nice addition to the card, and definitely helps the tempo loss from spending 2 dice not committing to the Battlefield. X: I’m not quite certain how to feel about this card. The required Magic Play Cost redundancy is certainly interesting, potentially pushing otherwise decent fringe cards like Shatter Pulse to be included, because it’s a decent 3 Magic Play Cost card that you could play or discard, depending on the situation. Unfortunately, experience says that fantasy is just that, a fantasy. More likely this card will be paired with a Phoenixborn like Rin, who could play Rin’s Fury, play Shared Sorrow to get back Rin’s Fury and clear off an enemy Unit. Which isn’t a bad thing, Rin has been on the fringe of highly competitive Phoenixborn for a while, just not as meta-shaking as I would have liked. N: I feel like using this with Elephants is an Ashes achievement now. The biggest problem for me with this card, is that you’re still sacrificing a ending up a card down. These days deck spaces are tight, all the cards I put in I want, so paying so I can discard one for another just feels like a bad trade. The final card for today is another incredibly flexible and powerful Sympathy Ready Spell card by the name of Resonance. Resonance costs a Main Action, 2 Sympathy class die and 1 basic die to play. 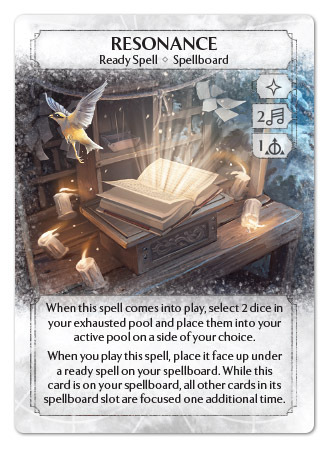 However, unlike other Ready Spells, Resonance doesn’t take its own Spellboard slot, instead it goes in the same slot as another named Ready Spell and triggers Focus abilities of that Spell. In addition, the user gets to select 2 dice in their Exhausted Pool and place them into their Active Pool on a side of their choice. While the immediate effects of this spell should be immediately apparent, it Focuses another Ready Spell an additional time, there are some possible ambiguities that need to be clarified. First, this card only affects Focus abilities, not Focus like affects. Playing this on a single Summon Indiglow Creeper Ready Spell will allow the user to place an additional status token whenever they use the spell, but playing this on a single Summon Shadow Spirit Ready Spell will not provide an additional Life to Shadow Spirits. Additionally, unlike the typical Focus effects, Resonance doesn’t provide an additional use of the Ready Spell. X: Like several cards before it, this card has me much more excited about is its potential future, than its current impact. This card obviously synergizes incredibly well with Summon Indiglow Creeper and Summon Silver Snakes, and has some other relatively minor synergies, like Small Sacrifice or Summon Masked Wolf. And while those are by no means insignificant, I hope that the future will have more cards like Summon Indiglow Creeper with powerful Focus effects. Also, a huge shout out to the playtesters or devs who realized that Butterfly Monks with up to 6 Life or consistent 2 Life Shadow Spirits would be a problem! N: The obvious synergy is with Indiglow Creeper, but I think the combination with Shadow Hound is worth looking at as well. Along with Open Memories to ensure the 2nd focus in the first round makes the Shadow Hound machine gun pretty scary. Altogether really like the design of this card and the cool options it opens up. Not exactly looking forward to the hordes of Creepers though. Thank you for joining us,as we continue to reveal the secrets from the other side. The final reveal for the last 3 cards in The Ghost Guardian should be available later this week. Again, Rimea is introducing a lot of very unique mechanics and a new keyword. What do think of all these mechanics? Any new combos that are enabled by these cards? Tell us about it in the comments below. As the celestial alignment shifts, our hold in this mortal realm wanes, and we must Fade Away again. But fear not, though our time here is soon coming to end, we live on, and we will return!